Witches Marks at the Wilbor House? I’m sitting in the 325 year old Wilbor House Museum by myself, listening to the wind howl, and staring at 13 Witches Marks. They are on the door directly in front of me, one of the doors that leads from my c. 1970 office space to the historic part of the house. There are more marks inside. In her article Amor writes that 17th-century English property owners inscribed a variety of Witches Marks on doorways and near hearths to prevent witches from creeping into their homes to lurk, unseen in the shadows behind doors and in dark corners, waiting to cause mischief or damage property. Some marks were placed near a family’s (or business’) valuables to ensure their safekeeping. The marks were often tangled together in order to tangle up the witches and better prevent them from entering the home. Historian Joanne Pope Melish pointed the marks out to me as superstitious symbols a year ago when she first toured the Wilbor House. There are quite a few. Aside from the 13 or so on the green door, there are about a dozen more over the doorway and hearth of our c. 1740 Long Kitchen. I had seen the marks many times before Professor Melish’s tour, but I thought they were something different. Much less Halloweeny. While our former Executive Director Carlton Brownell was training me, over a decade ago, he explained that the boards with the drawings were taken from a workshop in Westport and the tradesmen had doodled them into the wood. I don’t often contradict Carlton, sadly now deceased, but for the sake of Halloween let’s put his practical explanation aside for a bit and focus on superstition instead. In 1955-1957 when Carlton restored the Wilbor House its Long Kitchen was in particularly bad shape, and he used a great deal of wood from the Waite-Potter House of Westport, Massachusetts which was destroyed by a hurricane (Carol?) shortly before the Wilbor House restoration. 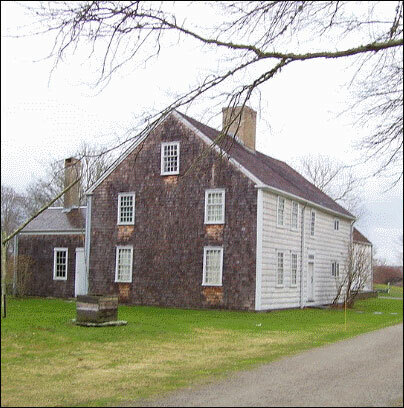 See the Waite Potter House below in a photograph owned by the Westport Historical Society. Note the “Potter” brand (weirdly upside down) in a board with many circular marks now positioned over one of our doors. Carlton may very well be correct that the Waite Potter House was used as a workshop sometime in its 250 year history, but before it was a workshop it was a house, originally dated 1677 and now, based on Kate Johnson’s work, more likely to be very-early-18th century. We must decide for ourselves whether it was 18th-century colonists or 19th-century workmen who made the marks. Today, on Halloween, I vote for early-18th-century Witches Marks. The tangled designs are so like those in Amor’s article that I find myself convinced. I also wonder why practicing workmen or apprentices would make designs on permanent walls rather than on scrap wood or even paper. More significantly, why would workmen tangle and overlap their designs in confusing ways? It doesn’t make sense. The tangled circles (shown below with a pencil rubbing of the green door) are perfect for trapping witches. They are pretty terrible for showing the skill of a craftsman. At least some of Little Compton’s first European settlers were superstitious. Several owners of local historic homes have recently shared the “concealment items” (usually worn shoes) hidden behind their fireplaces by early residents to keep evil spirits out. Why not Witches Marks, too? There’s one more bit of evidence that I was very happy to discover today. While 90% of our Witches Marks appear on boards most likely brought from the Waite Potter House, I found two very small, very simple marks on a huge beam over the hearth in our c.1690 Great Room. I am certain the beam is original to the house. I am less certain about the significance of the marks, but for the sake of Halloween, let’s just go with it. Perhaps our good Quakers Samuel and Mary (Potter) Wilbor, like the early Potter’s of Old Dartmouth (was Mary related?) may also have thought it wise to protect their family from stealthy spirits and cowering witches with these symbolic marks. No spirits bothered me today. I have a deal with them that they leave me in peace, and I will do the same for them. But I did find this broom in the Long Kitchen behind the door – maybe waiting for a visit tonight. It’s getting dark. I’m going home. Happy Halloween from the Little Compton Historical Society and the Wilbor House Museum. If you have apotropaic marks in your historic home please post them in the comments here, on our facebook page or email me at lchistory@littlecompton.org. I’d like to learn more.